WDI today unveiled a new book for its 25th anniversary that commemorates the Institute’s history, leaders, partners and inspiring work around the world. 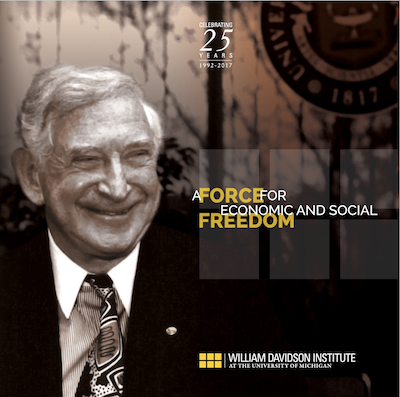 The book, “A Force for Economic and Social Freedom,” recounts the Institute’s founding and the dynamic life of its founder, Bill Davidson. The book also looks at the four people who have led WDI during its 25 years, and how each shaped the Institute in their own unique way. Four of WDI’s initiatives – Education, Healthcare, Performance Measurement and Scaling Impact – are profiled, including the goals of each and examples of some of their successful work. The book also reflects on WDI’s 25-year engagement with the University of Michigan community – its faculty and students. Some of the Institute’s many collaborations with U-M faculty are featured, as are the numerous global internships and MBA student teams that WDI has sponsored over the years. The uplifting stories of several past WDI interns and how the opportunity to work abroad changed their lives, also can be found in the book. The WDI Global Impact Speaker Series is discussed in the book, as well as two specialty areas of the Institute – case publisher WDI Publishing and the news and analysis site NextBillion. The book concludes with a look to the future, and what the next 25 years and beyond hold for WDI. The Institute received design and editorial assistance for the book from Michigan Creative, U-M’s in-house agency. Click here to download an electronic version of the book.